After that show of cuteness, she then wanted to dance a little for us as well. On this video you will notice that Katie Starr is pants challenged. You see, she is tall and thin and so her 3T length does not play well with her 18 month waist; even with an adjustable waist. By the end of the day, her pants end up below her hips......I should have such problems!! Go Katie!...what a dancer and oh to have that pants 'problem' with slim hips. Hope she continues to perfect her 'triangle' and 'square' poses. Too funny!!! I love Katie Starr's yogurt moves. She looks quite flexible. And her dancing? Move over Michael. You have competition. I know what you mean about the whole waist versus length thing. I'll be buying Erin's pants from The Childrens Place well into her teens at this rate! 6T length with a 24 month waist. I won't go into why this is all so unfair since you're there with me. Too much cuteness! I love her "yogurt" and dance moves (I see Marc's party influence here). And the pants issue - same here, we use leggings most of the time because it's the only thing I can get to stay "up" on her. All Kerri's jeans have adjustable elastic waists inside. Gymboree and The Children's Place are good places to buy them. Have a fun and great trip! Please post pics! That girl has got some moves! And there is nothing better at keeping that waist and hips slim than a good dose of yogurt each day. Molly has those same dance moves! Well, my computer is not bringing up the video of "yogurt" (funny), but I can tell you that I have the same problem with Caroline. She is going to be 5 in March, but her little behind is still 2T in shorts. She's finally starting to fit in some 3T depending on the cut, but the length of pants are more like capris. She is in 4Ts in dresses, though. Never had this problem with Peter. His chunky body was always 6 months bigger than his age. Now he has averaged out and fits in his regular sizes. Whew! 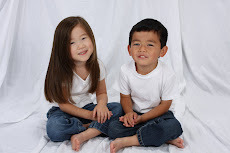 Love seeing new pictures of your kids and reading your blog. You have such a way with words that reminds me a bit of Erma Bombeck (whose writing I really miss). Love some yogurt myself. Not quite the same "flavor" as little miss though, heh. So great!!! Gotta love that yogurt! Chloe has the same pants problem...and I agree that I can only say I wish I had that problem! Awww, could she be any sweeter. Maybe if she had a bit more "fruit on the Bottom" her pants would stay up! I love those moves. I wish I had that same problem as Katie with my pants falling down. So cute.